38 • June 2018 www.concreteproducts.com CHAIRMAN'S REPORT BY DON MARSH RUBY CONCRETE CO. At-A-Gl A nce Ruby Concrete bills itself as the fourth oldest business in Kentucky. From a rural base southwest of Louisville, it supplies concrete block, hardscape units, manufactured stone veneer and clay brick to customers in western Kentucky. In addition to building and hardscape markets, it also serves area coal mines, which use concrete block to build permanent underground seals, airways and support structures. Gray and architectural block are run on a production line completed in 2009 that tripled Ruby Concrete's output capabilities. NCMA, through its Government Affairs Committee, is an active advocate for its members on Capitol Hill. In addition to pur- suing passage of check-off legislation (H.R. 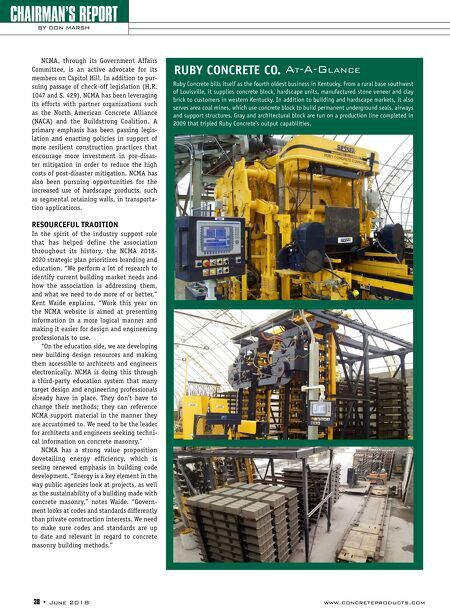 1047 and S. 429), NCMA has been leveraging its efforts with partner organizations such as the North American Concrete Alliance (NACA) and the Buildstrong Coalition. A primary emphasis has been passing legis- lation and enacting policies in support of more resilient construction practices that encourage more investment in pre-disas- ter mitigation in order to reduce the high costs of post-disaster mitigation. NCMA has also been pursuing opportunities for the increased use of hardscape products, such as segmental retaining walls, in transporta- tion applications. RESOURCEFUL TRADITION In the spirit of the industry support role that has helped define the association throughout its history, the NCMA 2018- 2020 strategic plan prioritizes branding and education. "We perform a lot of research to identify current building market needs and how the association is addressing them, and what we need to do more of or better," Kent Waide explains. "Work this year on the NCMA website is aimed at presenting information in a more logical manner and making it easier for design and engineering professionals to use. "On the education side, we are developing new building design resources and making them accessible to architects and engineers electronically. NCMA is doing this through a third-party education system that many target design and engineering professionals already have in place. They don't have to change their methods; they can reference NCMA support material in the manner they are accustomed to. 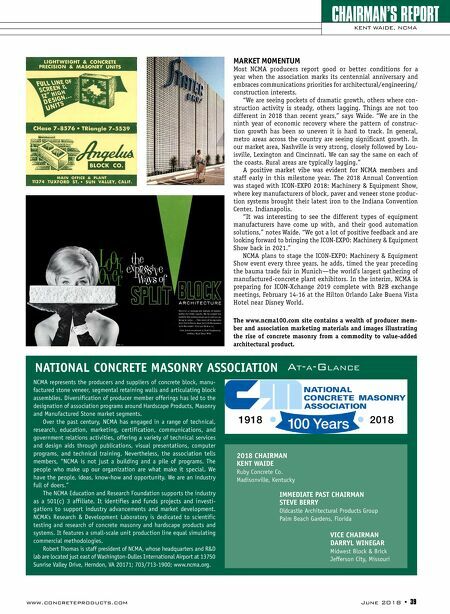 We need to be the leader for architects and engineers seeking techni- cal information on concrete masonry." NCMA has a strong value proposition dovetailing energy efficiency, which is seeing renewed emphasis in building code development. "Energy is a key element in the way public agencies look at projects, as well as the sustainability of a building made with concrete masonry," notes Waide. "Govern- ment looks at codes and standards differently than private construction interests. We need to make sure codes and standards are up to date and relevant in regard to concrete masonry building methods."